The London Marathon was held earlier today, and among its runners? Astronaut Tim Peake, orbiting above the Earth on the International Space Station, and he set the world(?) 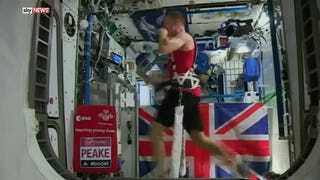 record for running a marathon in space. Interestingly, he’s not the first astronaut to tackle this feat: that honor goes to Astronaut Sunita Williams, who posted a four hour, twenty-four minute run time in 2007's Boston Marathon. Running a marathon in general seems like an insane proposition to me, but running it in space? That’s just awesome.